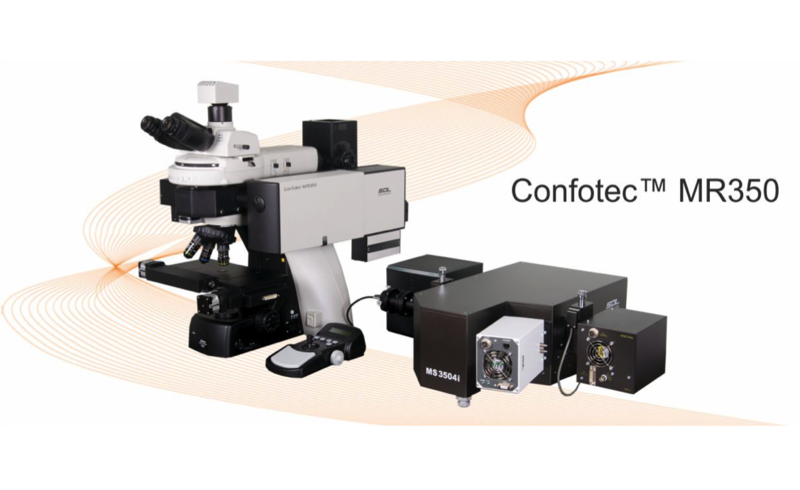 Compact Raman confocal microscopes Confotec™ MR350, Confotec™ MR520 and Confotec™ MR750 are intended for micro spectroscopic measurements with the high-end system capabilities. are intended for micro spectroscopic measurements with the high-end system capabilities. All models have a rigid design that does not require adjustments and have both high sensitivity and high spatial resolution. Spectral measurements are provided by a highly automated 350, 520 or 750 mm focal length Imaging monochromator-spectrograph with a motorized 4-position grating turret. Performance capabilities, high reliability and compact design of confocal microscopes Confotec™ MR350, Confotec™ MR520, Confotec™ MR750 allow researchers to tackle different, crucial tasks in science and industry. Semiconductors, liquid crystals, polymers, pharmaceutical and biological substances, single molecules and nanoparticles can be objects of research. We offer 5 configurations of a Confotec™ Raman confocal microscope to realize optimal solutions for your needs. Raman confocal microscopy is widely used in pharmaceutics. molecular conformers in various drugs. is expected to play the important role in the near future. due to quickly reducing cost. widely used in cutting or polishing tools. with high spatial resolution are required. to the structural perfection of diamond. Polymer multilayer films play an increasingly important role. as packing, insulating or coating material, etc. three-dimensional characterization of polymer films. Objective lenses: 100х NA-0.95, 40х NA-0.75, 20х NA-0.50, etc. Long term power stability: <2% / 8 h.
Long term power stability: <3% / 8 h.
Long term power stability: <5% / 8 h.
Long term power stability: <1% / 8 h.